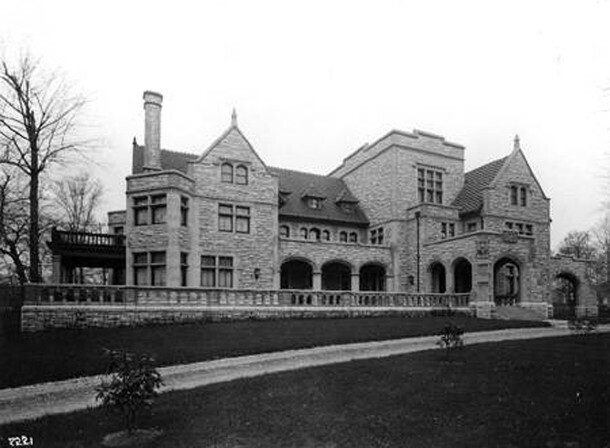 The residence that formerly stood at 2820 North Meridian Street graced the landscape along the prominent northside thoroughfare from 1906 until 1965. The commercial building that replaced the demolished home was completed early in 1967. The residence was built by Frank Van Camp (1863-1937), the youngest of the six children of Gilbert Cortland Van Camp (1817-1900) and wife Hester (Raymond) Van Camp (1828-1912). Gilbert Van Camp was the founder of the eponymous canning and packing company, whose origins date to 1862. Van Camp & Sons Canning and Packing Company partnered with Stokely Brothers in 1933 to become the Stokely-Van Camp Company. A young Frank Van Camp is credited with being the person who conceived of the distinctive flavor of Van Camp’s Pork and Beans in 1894. Thinking the beans by themselves were bland, Frank added some ketchup and bits of bacon to them. The result was a big hit with customers. 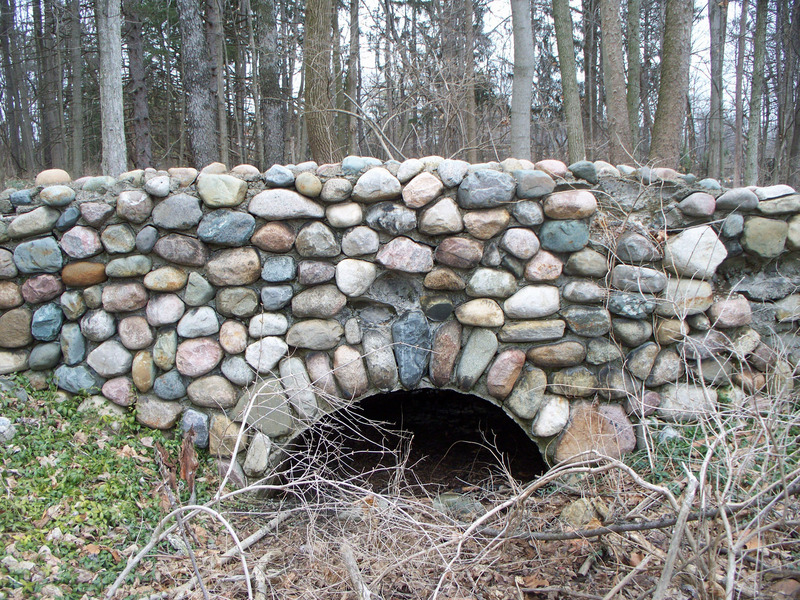 By the end of the 19th century, the company had six plants around the country. Those same ingredients are still used today. You can read more about Van Camp products in a 2011 Historic Indianapolis article here. After Gilbert Van Camp’s death in 1900, Frank took over the reigns of Van Camp & Sons Canning and Packing Co. Frank’s older brothers, Cortland and George, had left the family business to start the Van Camp Hardware and Iron Company. The popularity of Van Camp’s Pork and Beans made Frank a wealthy man. He decided to demonstrate his success by building his family a magnificent mansion. In 1906, a 43-year-old Frank Van Camp and his wife Clarissa (Lintner) Van Camp (1865-1914), along with their teenaged children, Gilbert and Marguerite, moved into their new home just north of Fall Creek. In 1914, Frank’s beloved wife Clarissa died at only 49 years of age. 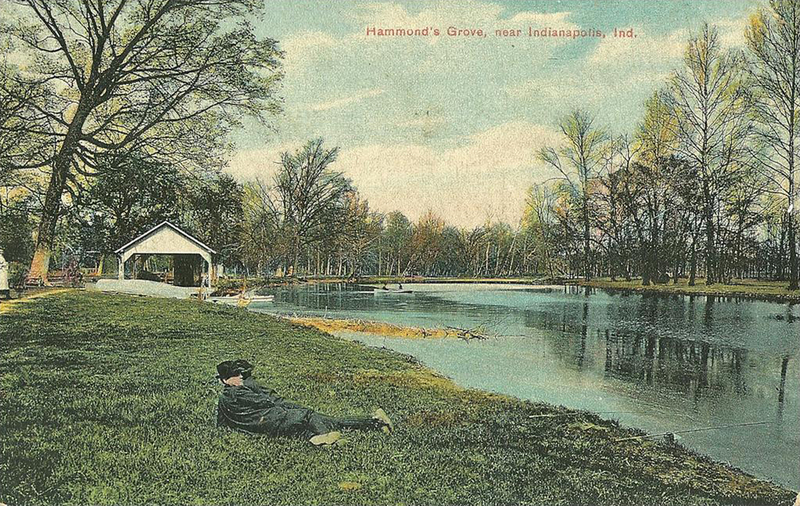 By the time the 1915 Indianapolis City Directory was published, the home at 2820 North Meridian Street was listed as vacant. Frank Van Camp moved to Los Angeles, California, where he remained for the rest of his life. From 1915 to 1921, the former Van Camp mansion was home to Samuel T. Murdock (1870 – 1921), his wife Addie (Gordon) Murdock, and their grown children, Alexander and Alice. Sam Murdock owned the Capitol Warehouse Company at 213 East South Street. After Samuel’s death in 1921, Murdock’s widow continued to live at 2820 North Meridian Street for about three more years. 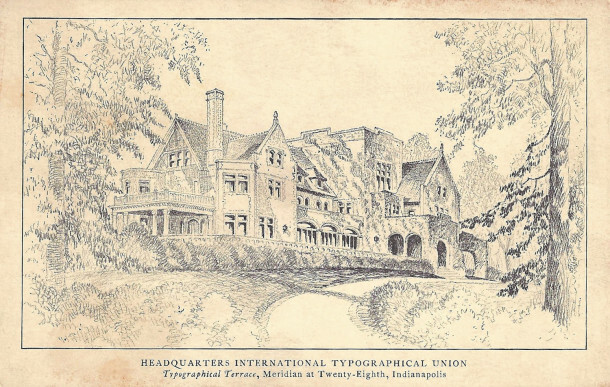 The International Typographical Union was founded on May 5, 1852, in Cincinnati, Ohio. As a result of a random drawing at a national convention, Indianapolis became ITU Local #1, as well as the union’s national headquarters. The ITU gained a reputation over the years as being the most democratically governed union in the country. Throughout its history, the ITU was progressive in its initiatives. It lobbied for 8-hour work days and making work on Sundays elective, not mandatory. Although the ITU embraced technological change, the computerization of printing trades reduced the number of typographical jobs. Late in 1986, the ITU voted to merge with the Communications Workers of America (CWA). 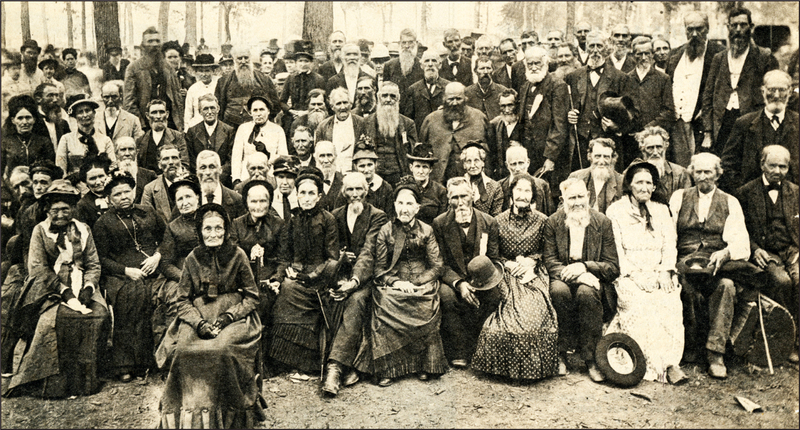 Prior to the merger, ITU was the oldest continuously operating union in the United States. 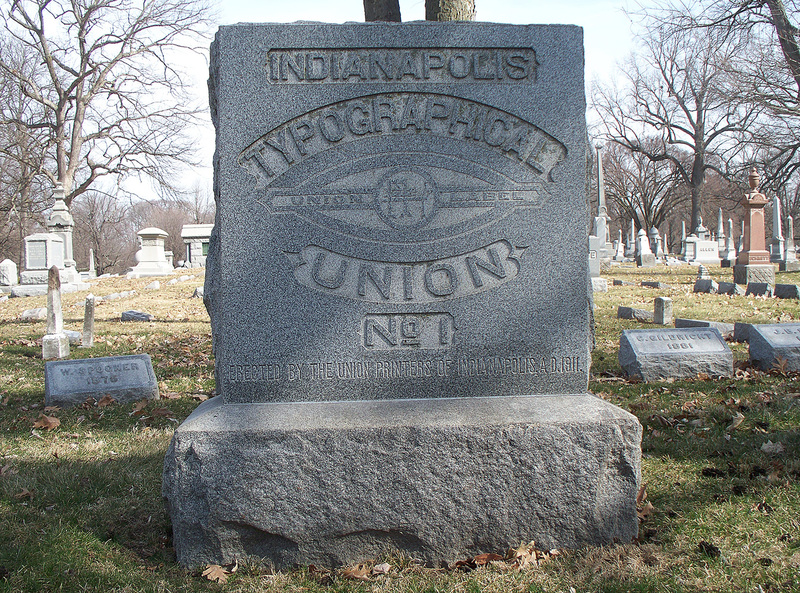 In researching the ITU, Historic Indianapolis discovered an area at Crown Hill Cemetery where a number of ITU members are buried together. The marker was erected in 1911. The 13-story commercial building that remains today was built by the Stouffer Company of Medina, Ohio, a suburb of Cleveland. Construction began in 1966 and was completed in 1967. Stouffer’s Indianapolis Inn opened in April of 1967. An early newspaper article that mentioned the hotel appeared on May 30, 1967. That article referenced the many hotel guests who had to extend their reservations because rain delayed the running of the Indianapolis 500 Mile Race that year. 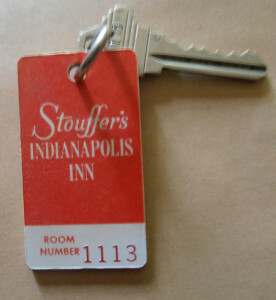 The earliest Indianapolis City Directory in which Stouffer’s Indianapolis Inn was listed was the 1967 edition. The 1966 city directory said “Under construction” for the address. A view from the top of the former Stouffer’s Indianapolis Inn can be seen in a 2011 Historic Indianapolis article here. 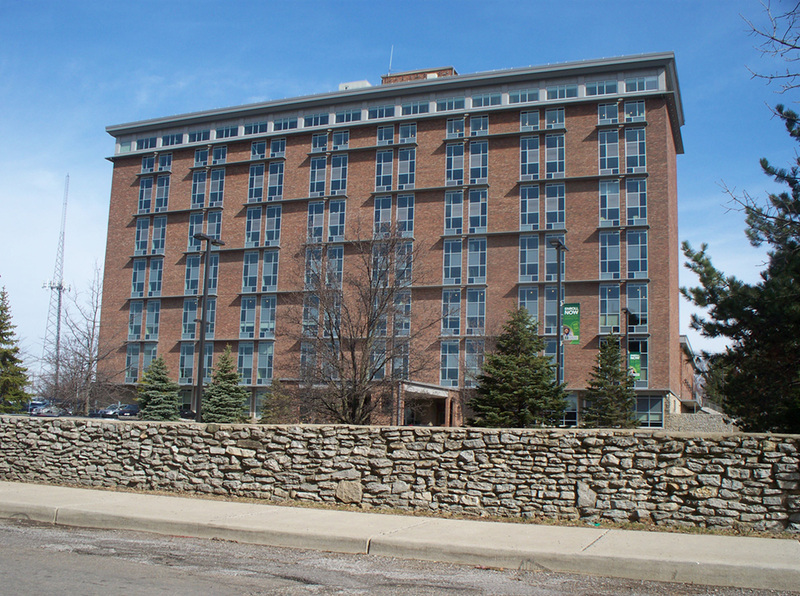 The hotel’s business faltered as Downtown Indianapolis began to experience a rebirth. Under new management, the name of the hotel was changed to Sheraton-Meridian in 1981. It closed in 1989, after which time it sat vacant for several years. Bill Gothard Ministries and his controversial Institute in Basic Life Principles operated in the building in the late 1990s and early 2000s. The Chicago-based advocate for home schooling and conservative dress recently resigned from his position over allegations of sexual harrassment. With a grant from Lilly Endowment, Ivy Tech Community College acquired the property in 2010 and renovated the facility for classroom and conference space. The Corporate College and Culinary Center opened in August of 2012. 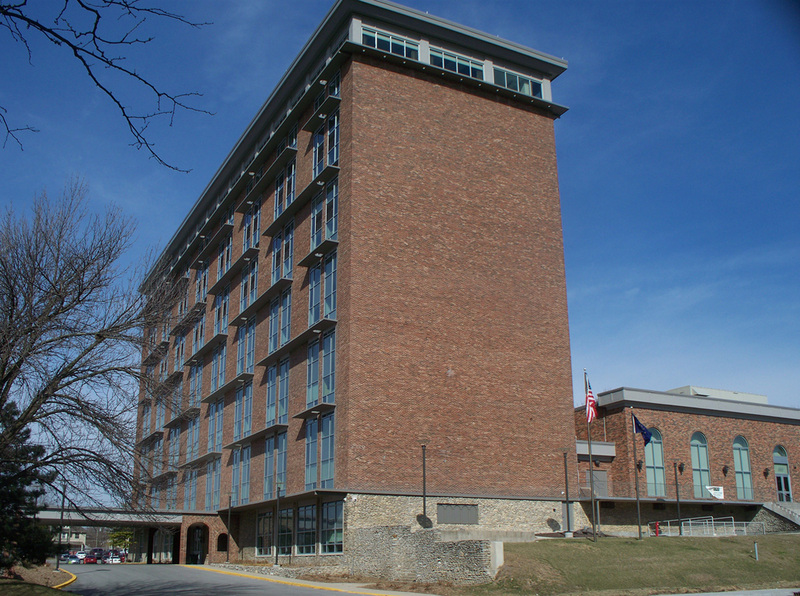 It houses the region’s Corporate College and Hospitality Administration Program, as well as a conference center. With state-of-the art technology, the center provides training and development solutions for Indiana businesses through specialized courses and certifications. The center also features a student operated fine-dining restaurant called Courses Restaurant and a café called Courses Bakery, as well as a conference center with over 12,000 square feet of meeting space available to the public. If anyone has a memory of either the former residence or the current building, please share it by posting a comment below. According to a biography of Senator Homer Capehart, Capehart had come up as a very young man from southern Indiana to work one summer on the Van Camp estate, at least until a “friend” stole his hard-earned money, and he returned home. Then, many years later, after being defeated by Birch Bayh, he bought the old estate, tore it down, and developed the Stouffer’s Inn, often dining in its 12th floor restaurant. 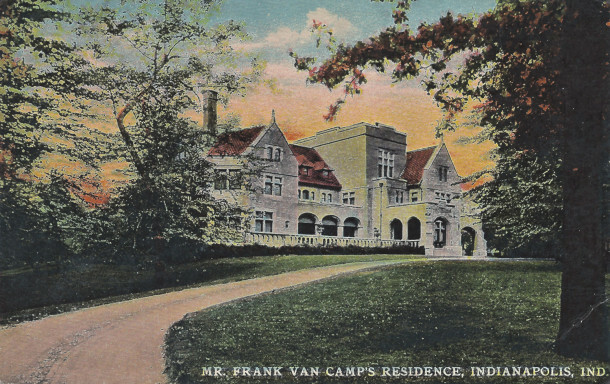 Thank you for relating Homer Capehart’s connection to the demolition of the Van Camp residence and the construction of Stouffer’s Indianapolis Inn. Senator Capehart was the person who nominated my husband for an appointment to the United States Air Force Academy. Capehart shepherded Mike’s nomination through the competitive application process. Coming from a family of modest means, Mike has always valued the first-rate education he received at the USAFA, not to mention the 14 years he got to fly planes for the Air Force. I drank a beer or five in the Grog Shop, where patrons were encouraged to throw their peanut shells on the floor. Also ate in the top floor restaurant. It was quite nice. 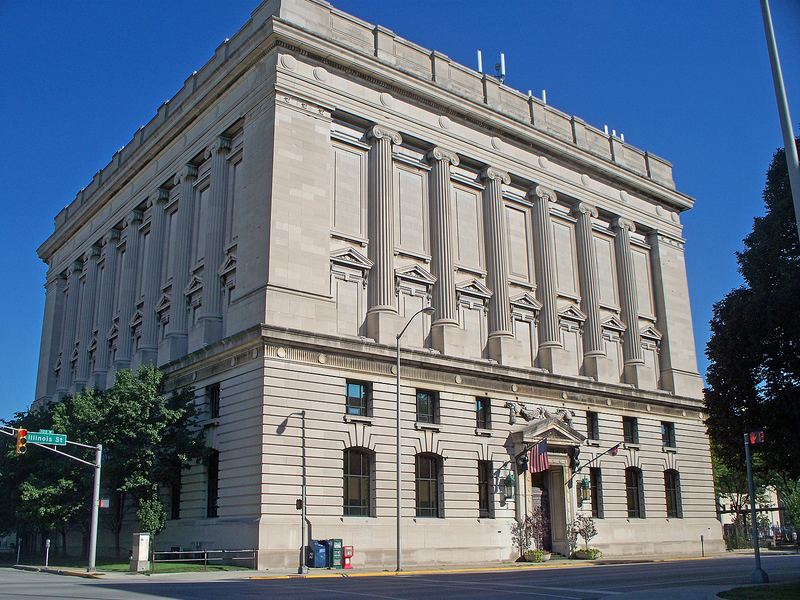 The Indiana Young Democrats held their annual convention in 1967 at Stouffer’s. Birch Bayh spoke. 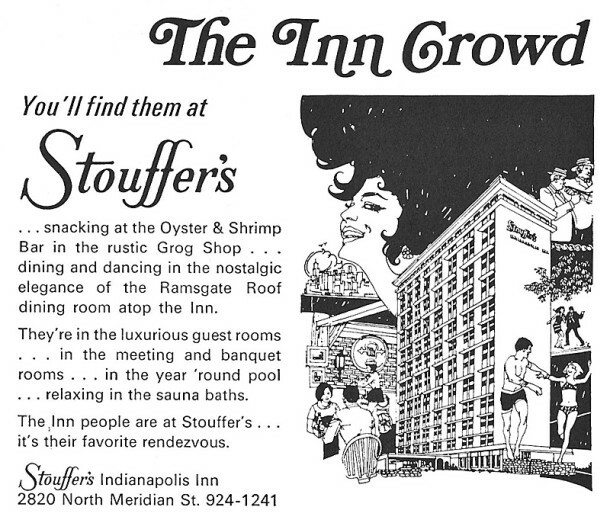 I suspect most of us who came of age in the ’60s and ’70s drank a beer or five in the Stouffer’s Inn Grog Shop. I always felt a little guilty throwing my peanut shells on the floor, but it seemed to be de riguer at the time. It’s interesting to learn from Tom Davis that Republican Senator Homer Capehart was involved in the loss of the Van Camp residence, as well as the gain of Stouffer’s Indianapolis Inn, and then to learn from you that Capehart’s nemesis, Democrat Senator Birch Bayh, was the speaker at a convention in the hotel soon after it was built. Ah, politics! Attended a couple of meetings here in 1968 and 1969…remember the Grog Shop that Louis mentioned…also ate at the Roof Top restaurant with the fantastic view of the downtown skyline. Loved that view! Glad that Ivy Tech has put it to reuse; best for the north Meridian Corridor from an urban planning standpoint. It would be cool if the Roof Top restaurant were open to view the city again….interesting about Homer Capehart’s link here! Finally had a chance to meet him after he left the Senate. A restaurant called COURSES is operated by students in the former Ramsgate Roof Restaurant. You can view both the lunch and dinner menus, as well as make a reservation, here: http://www.ivytech.edu/indianapolis/courses.html. My Grandfather worked for the Typographical Union for a few years in the late 1930’s. In fact, they moved my grandparents and my mother to Detroit for a year (1939), then he returned to Indy. Both my grandfather and father were proud members of International Typographical Union Local #1. 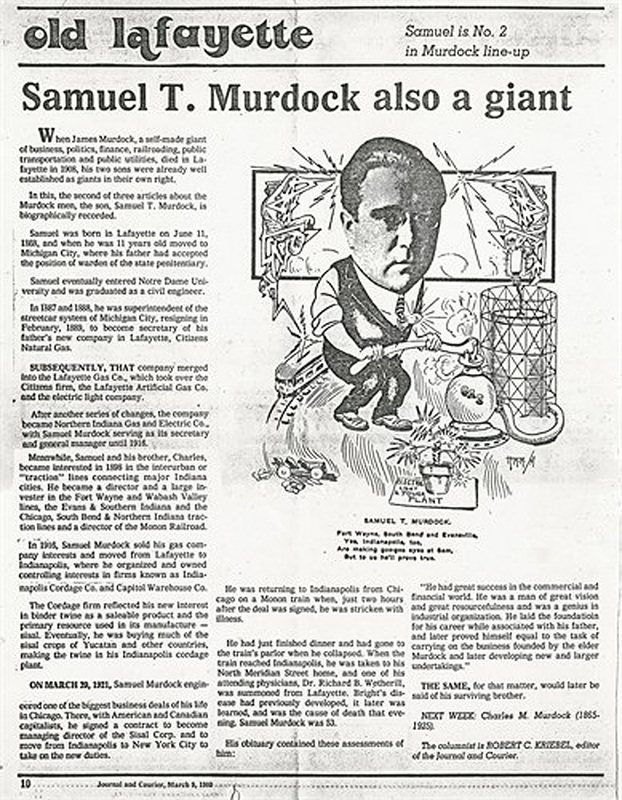 My grandfather was a printer at The Indianapolis News for nearly five decades. My father was first a printer at The Indianapolis News, then at The Indianapolis Times, and finally at Cornelius Printing Company. The skills they developed over a lifetime are now a lost art. I ate at the Rooftop Restaurant once, right before it closed in the 80s. I remember the view was amazing. They are open for lunch and dinner; however, the days vary. The restaurant has also gotten good reviews. A portion of the food sale proceeds goes to support of scholarships for students in the hospitality program. Go support the Ivy Tech! I have a jazz LP that was recorded at Stouffer’s (Larry Liggett Swings Stouffer’s). There’s no date on it, but it looks to be from the early 1970s. It has Oliver Napier on drums, Reginald Duvalle, trombone, Larry Liggett on alto, Lancaster Price on trumpet, Maurice Johnson, piano, Fred Monroe, tenor, and Harold Gooch, bass. It’s a really nice record album. David, here’s a little info on Larry Liggett, http://goo.gl/gnLGYu, who apparently was an educator as well as a performer. Looks like your album came out in 1969. Larry Liggett’s band used to play at Shortridge High School dances in the ’60s. Those were the days! I lunched there often on business, but most memorable was with Liberace (year uncertain, but he was making a local appearance). I helped PR Marion County Mental Health Christmas Gift Lift by creating a year-round “Give A Wrap”–throughout year when stars, VIP’s, “names” came to town, I pre-arranged to have them wrap, autograph a gift for mental health hospital holiday project–plus having them do a pro bono public service radio spot, which was aired during the holiday. It was amazing how cooperative stars like Geo Goble, Robt Goulet, Robt Wagner, and many others were–but of all, Liberace was the greatest. My system was to keep ribbon, wrapping paper and some token gifts in the trunk of my car, plus tape recorder at hand–have the “star” photographed at the wrap, etc. But when Liberace came to table for lunch, he abololutely l-o-v-e-d creative and elegant wrap — so much so, he sent his aide to his suite and brought back a dozen or so albums which he wrapped and donated. Of all the stars, most memorable was Maurice Chevalier, a totally reclusive star who barred media from his Marott suite–with the single exception he agreed to do a public service spot for Mental Health Gift Lift. It was a great promotion in its day–but I can still see Liberace unreeling and tossing Yule riibbon, paper wrap joyously in the middle of a hot summer in Stouffer’s Inn. Thank you for your reminiscences. It was interesting to read the names of the celebrities you persuaded to lend their support to the Marion County Mental Health Association’s Gift Lift. My mother was chair of the Gift Lift for many years. Conceived of by her friend, MCMHA’s Executive Director Norman Skole, the Gift Lift had no facility in which to store the gifts in its early years, so they all wound up at my family’s house. My mother put her 7 children to work, sorting and wrapping the gifts for the patients. I have to confess that I occasionally helped myself to a pack of gum or lifesavers while I was toiling at my assignments. I would have only been grade-school age at the time, but I should have known better. Fortunately, the sorting and wrapping moved from our family’s living room and dining room to more appropriate quarters after a few years, or my pilfering might have escalated to socks, tee-shirts, pajamas, or sweaters. A few years later, when I was high school and college age, I became the babysitter for Norman and Yvonne Skole’s children. Donna Mikels Shea, great story. Where have you been hiding? Barringer’s is now closed. Would love to have lunch some day soon and trade war stories. I was raised in that area and used to pass the “mansion” on our way to the old Children’s Museum. It seemed so massive! My mother worked for years at the Marrott, both in the dining room and a cigar stand, so I was always near there. She moved into the high-rise apartment building after Stouffer’s was built, and they allowed her (and I when I would visit) to use their swimming pool facilities. That neighborhood was a very odd one to grow up in but always very interesting! I have searched relentlessly for the location of the ketchup plant to no avail. Nor was I able to find the location of the “Van Camp’s Packing Company.” And I don’t know if both locations were one and the same. Would you happen to have the addresses of either location from back in the 20s? Hope the above links help to answer your questions. I have some information about the Van Camp Mansion, starting in the late ’40’s. In 1948, my father Joseph Bailey was elected third vice president of the International Typographical Union. Their headquarters at that time was in the mansion at 28th and Meridian. We relocated from San Francisco to Indianapolis and thus began my life as a Hoosier. Dad gave me a tour of the headquarters shortly after we arrived. Upon entering the front door, you faced a huge heavily carved staircase. It was made in Italy, as was all the beautiful woodwork in the building. It split at the top into two sets of stairs one going north and the other south. This floor led to the offices of the union offices. They were in the former bedrooms and were well cared for. The bathrooms all had oval marble sinks with gold (not sure if they were really gold) fixtures. The union wanted to keep as much of the original structure unblemished as they could, so no nails or screws were used in the floors or walls unless absolutely necessary. The third floor was the ballroom and was used as a carton storage area. The main floor was where the secretarial staff was housed. In keeping with the no nails and screws, all partitions were on wheels divide off the spaces. The kitchen in the rear of the house was used as the printing room. It was all white tile and kept spotless.In the back of the property was a carriage house. I don’t recall what it was being used for. I visited many times over the years, and it was still in pristine condition. In 1961 or 1962, it was decided to move the office to some union property in Colorado Springs, CO. My parents moved, but by then I was married with a family, so I stayed. Homer Capehart made an offer to buy the property and was going to make it into a rather medieval hotel, using the carriage house as a special facility for long term rental. His offer of $1,000,000 was deemed too low, so he withdrew it. The buildings sat empty for a few years until Stouffer’s made their offer, which was accepted, although it was much lower than the first one. I was heartsick to see the whole place torn down, the hill filled in, and a modern structure erected. The history of the union itself is very interesting and the reason it was determined to use Indianapolis as the home for its headquarters. I may write about that another day. I am now in my 80’s and tire more easily than I once did. I’m so glad to read your words, this has been a memory that I’ve felt ‘alone’ in… cheers ! I would truly love to see a floor plan and grounds layout of that mansion! Surely the plans exist somewhere. . .